An original Andrew Brownswood "Lady Di by Dino" Valentine Card reading ; "Hey Valentine Not Many Men Will Receive a Valentines Card from Princess Diana .... and your one of them !!" 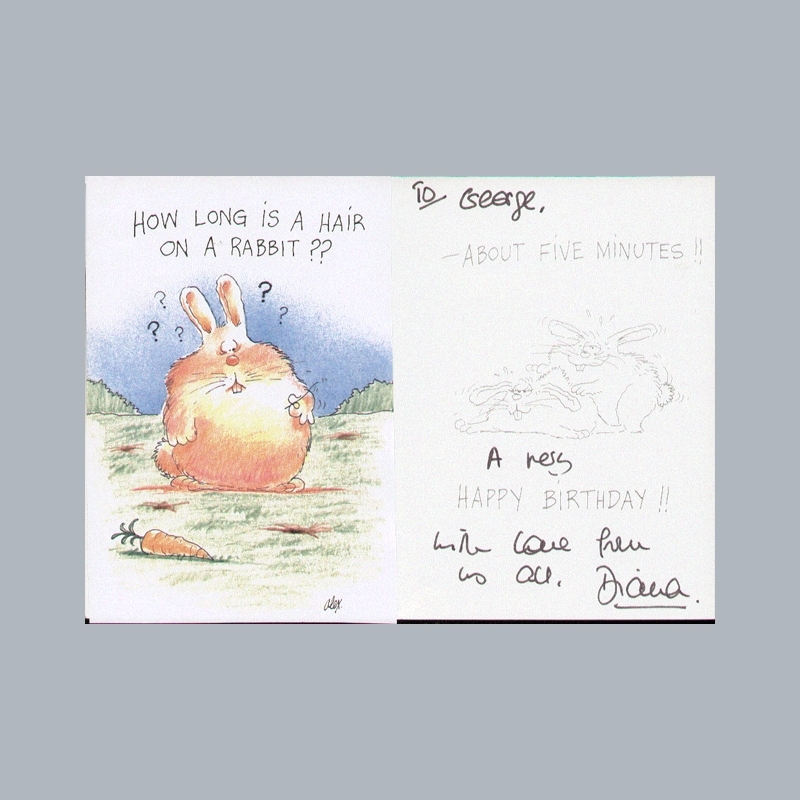 The card is clearly signed inside in ink ; "To George from Diana !". 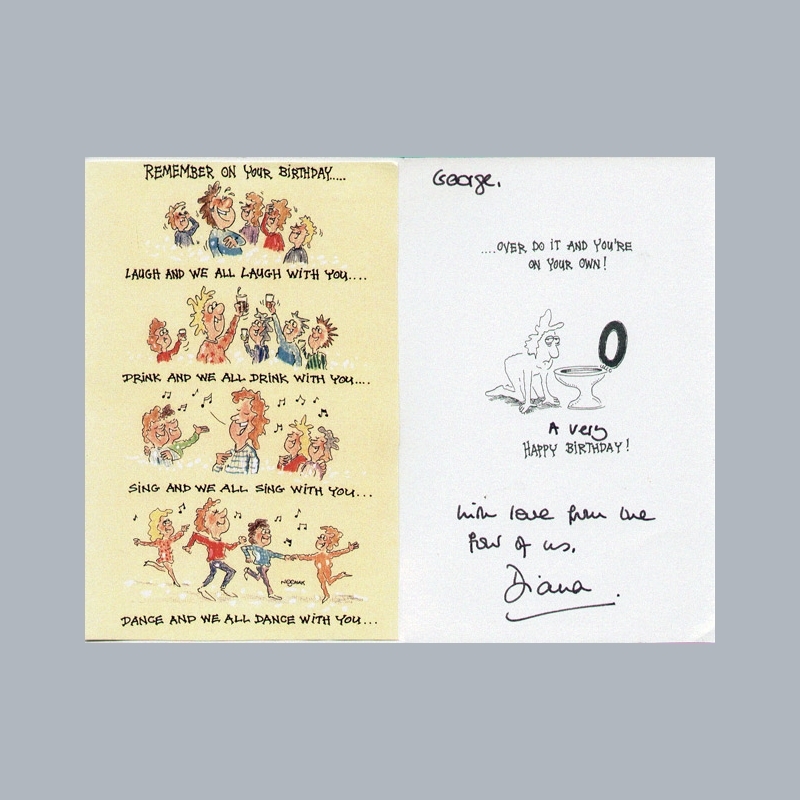 An outstanding piece of memorabilia and a truly wonderful opportunity to purchase a very special Diana signature. 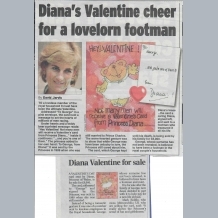 Would be really hard to better this, due to her being known as "The Queen Of Hearts". 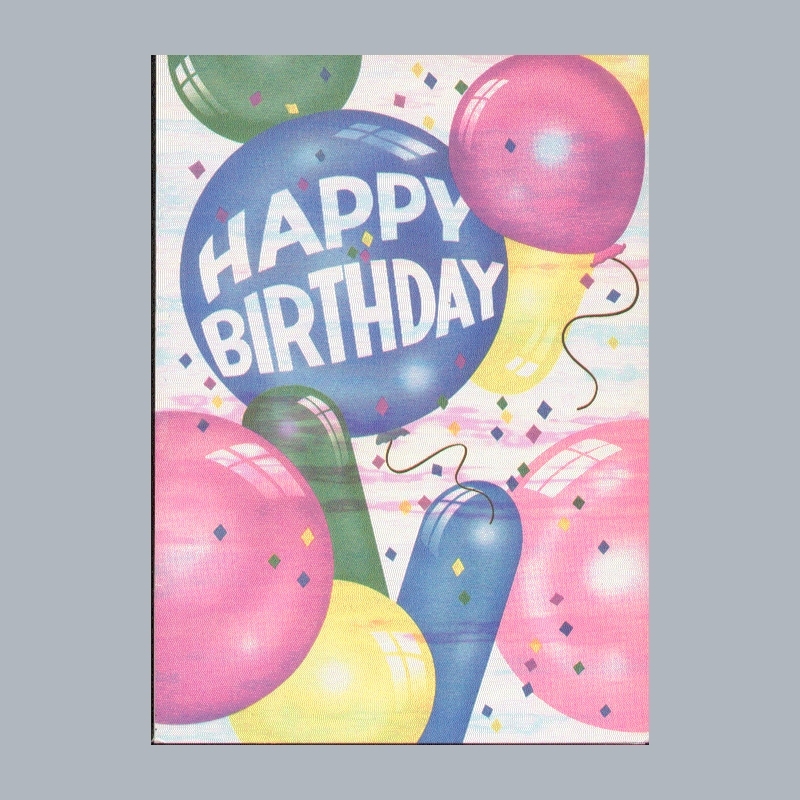 PLEASE NOTE ; In view of the value of this item, we are UNABLE TO SHIP THIS ITEM OVERSEAS without discussing postal costs involved which will be substantial. 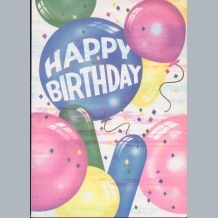 We will also NOT ACCEPT PAYPAL as payment for this item. Payment can only be by Bank Transfer or Switch / Credit card. PLEASE CONTACT me to discuss. You will find my website by doing a Google search for Memorabilia UK Autographs Mark Riddle. Then email me via the contacts section on the home page. Very Good. 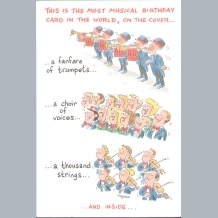 View Images. 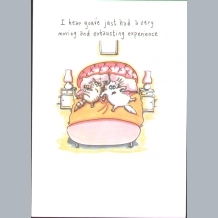 We would rate as 9.5/10. 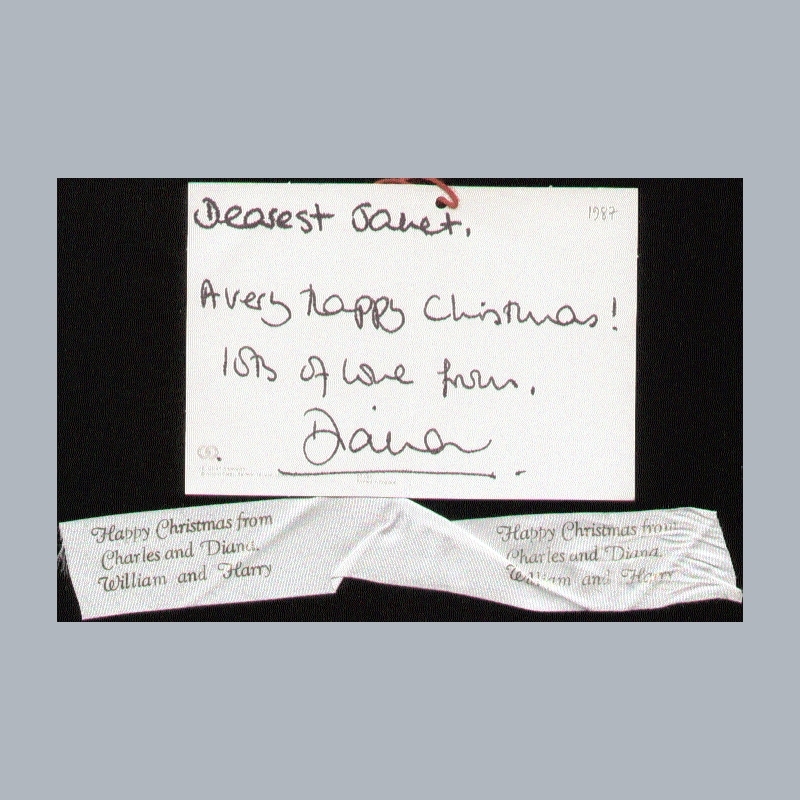 DIANA PRINCESS of WALES d1997. 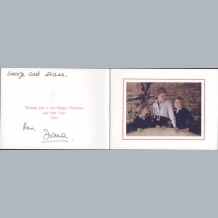 The Princess of Wales and mother to William and Harry. 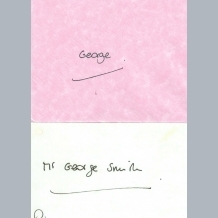 Engaged to Charles Prince of Wales on February 24th 1981. Married July 29th 1981 at St Pauls Cathedral billed as "The Fairytale Wedding" in front of a worldwide TV audience of 750 million. Separated on 9th December 1992 and divorced on 28th August 1996. 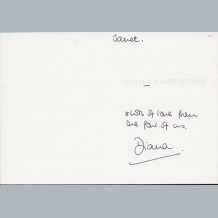 Diana lived her whole life under an intense and constant media security. 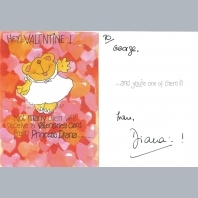 After her divorce she became known as "The Queen of Hearts" for her often remarkable involvement in charity work including Aids Awareness and Landmines. 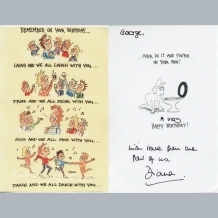 She died on 31st August 1997 aged just 36, following a car crash in The Pont D'Alma road tunnel in Paris along with Dodi Al Fayed. Her sudden death and funeral in Westminster Abbey on 6th September 1997 led to a spontaneous and prolonged show of public mourning. 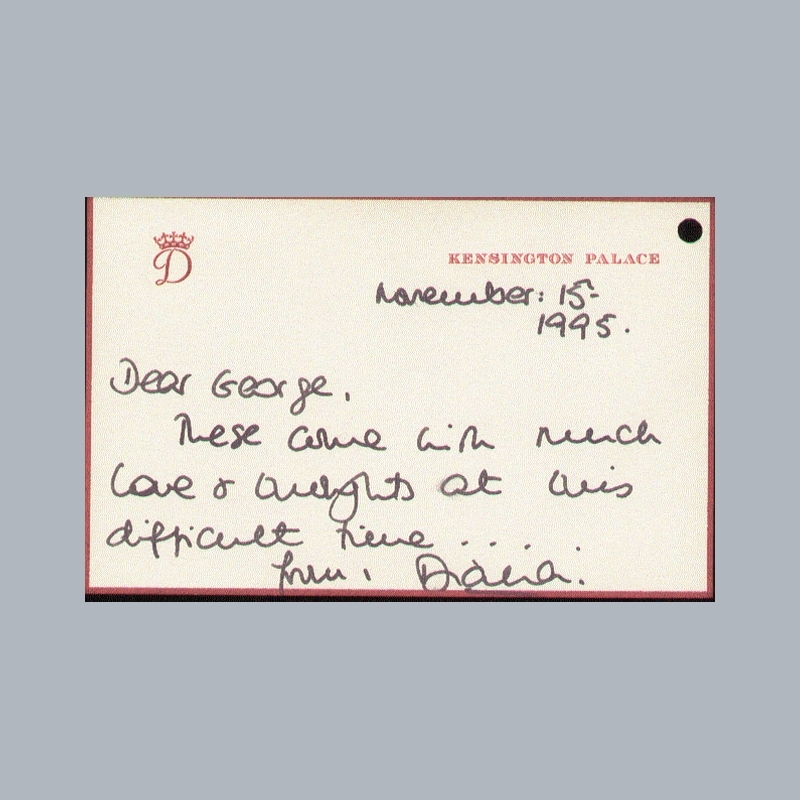 Contemporary responses to Diana's life and legacy remain mixed, but a popular fascination with The Princess will ensure her affectionate memory in the centurys to come. 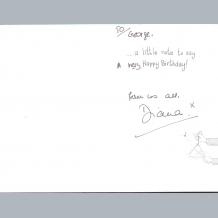 The long awaited coroners inquest into her death concluded in April 2008 that Diana had been unlawfully killed. 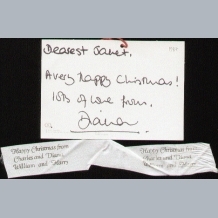 A rare and quirky 1987 Christmas present tag clearly signed in ink ; Dearest Janet, A very happy Christmas, lots of love from Diana. 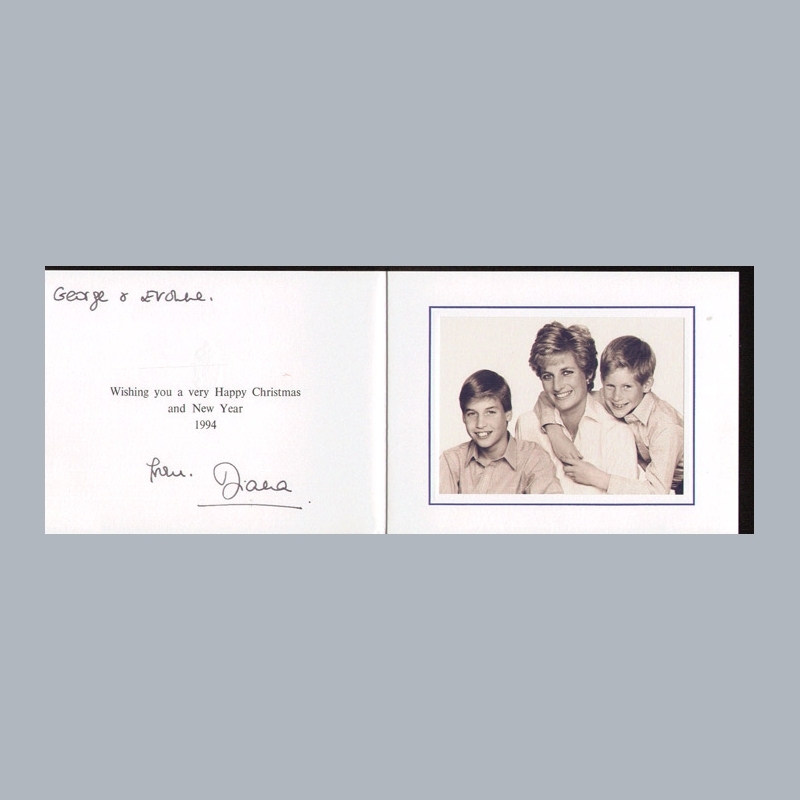 Sold loose as instructed with the original official ribbon from the present printed with Happy Christmas from Charles and Diana William and Harry. 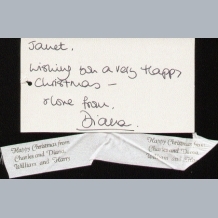 A rare and quirky 1988 Christmas present tag clearly signed in ink ; Janet, Wishing you a very happy christmas and love from Diana . 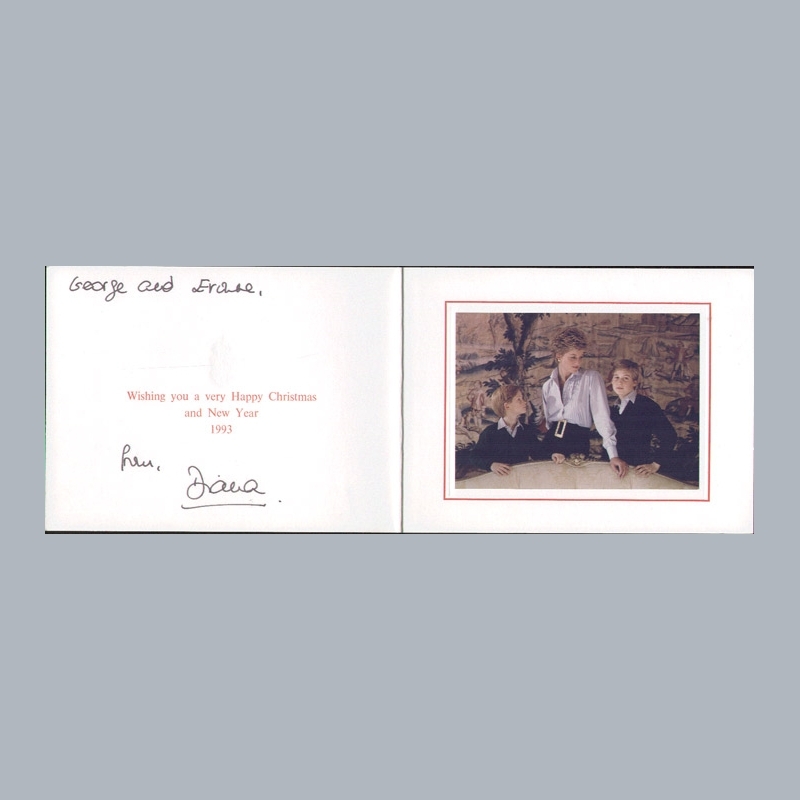 Double mounted all acid free for fine display with photographs and the original official ribbon from the present printed with Happy Christmas from Charles and Diana William and Harry. 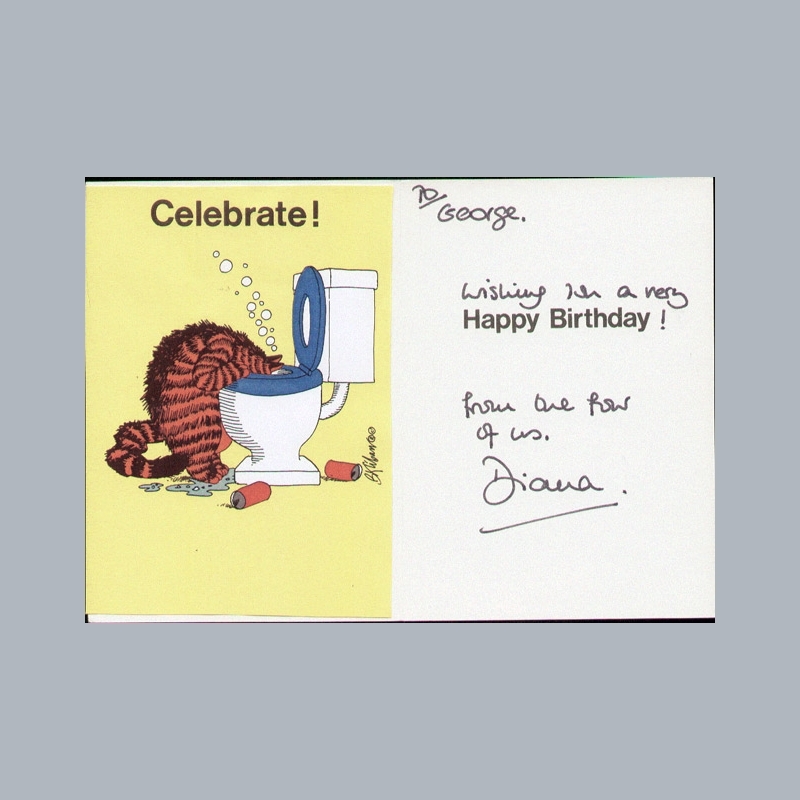 An outstanding and amusing original Emotional Rescue Birthday Card dedicated and signed ; With Love From Us All Diana. 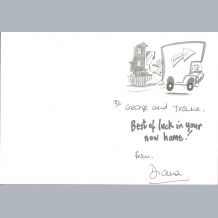 Includes original handwritten and dated envelope "Colonel George". 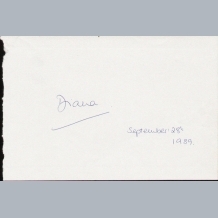 A large page from a visitors book clearly signed and dated in ballpoint ; Diana September 28th 1989. 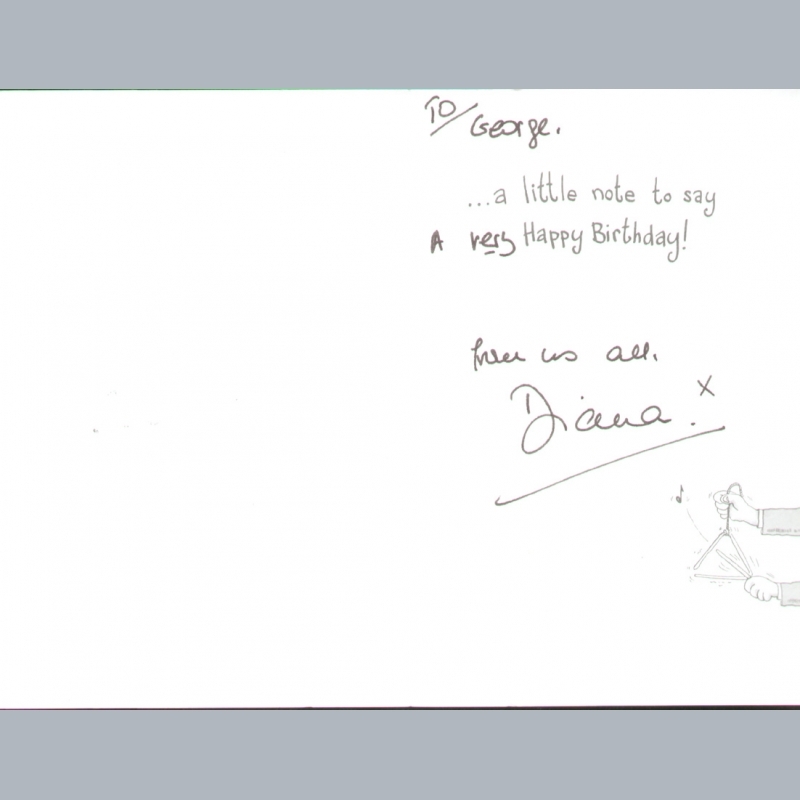 An outstanding and amusing original Camden Graphics Birthday Card dedicated and signed ; From The Four of Us .. Diana. 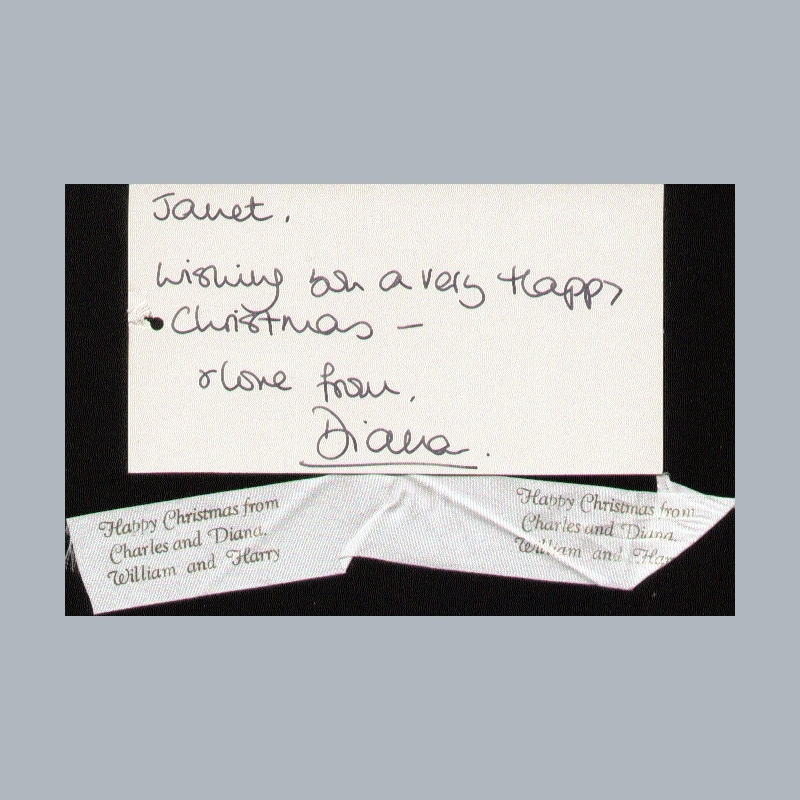 A rare and quirky 1987 Birthday card clearly signed in ink ; Janet, lots of love from the four of us Diana. 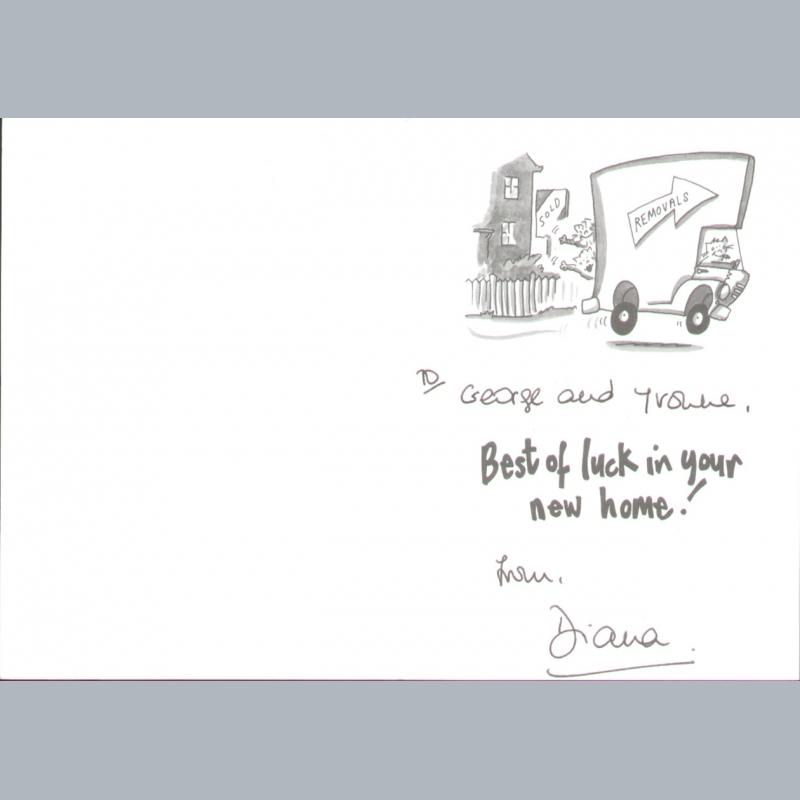 An outstanding and amusing original Camden Graphics Best Of Luck In Your New Home dedicated and signed ; To George and Yvonne .... .. From Diana. 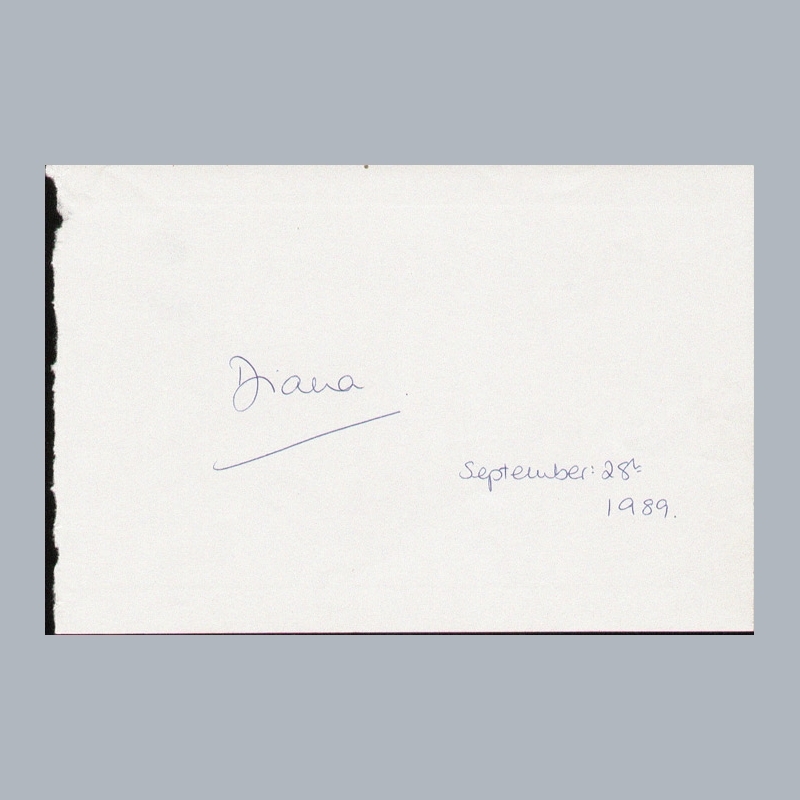 A personal handwritten note on her own official embossed Kensington Palace card with crest. 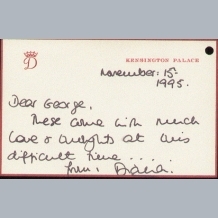 Dated November 15th 1995 ; Dear George ; These come with much love and thoughts at this difficult time .. From Diana. 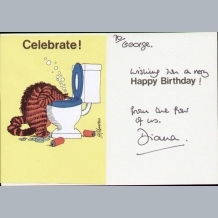 An outstanding and amusing original Camden Graphics Birthday Card dedicated and signed ; To George, A very happy birthday .... .. From us all, Diana x. 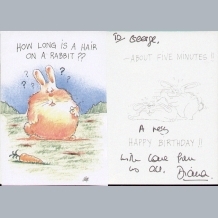 An outstanding and amusing original Camden Graphics Birthday Card dedicated and signed ; From The Four of Us Diana. 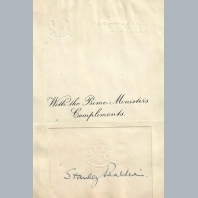 Includes original handwritten and dated envelope. 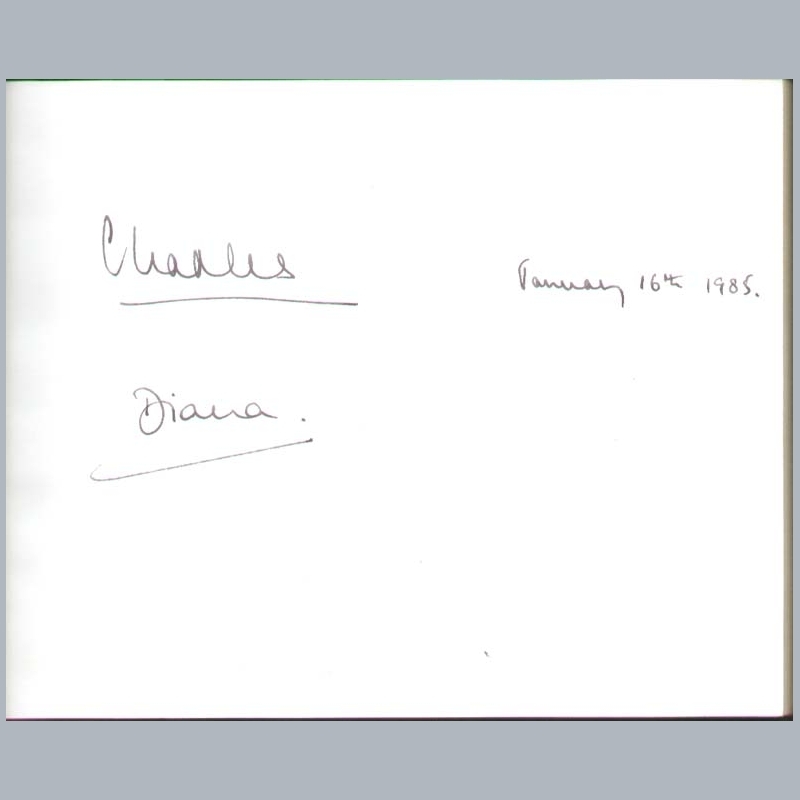 A very good large page (still within the original visitors book), clearly signed in ink by both Charles (adding the date January 16th 1985) and Diana. 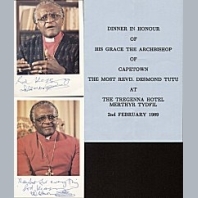 The page could be removed from the book and mounted for fine display if required. 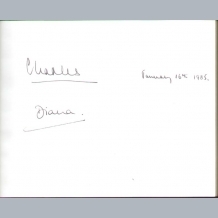 The visitors book was signed on January 16th 1985 at The Horton Hospital Epsom Surrey during the couples visit there during the Jubilee Celebrations. 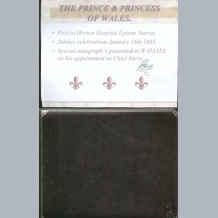 It was presented to W Hayes on his appointment as Chief Nurse. 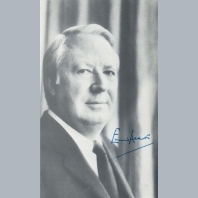 There is a print-out page (shown) showing this and a letter further detailing the history included. AFTAL Dealer No13 and UACC RD Memorabilia UK COA. 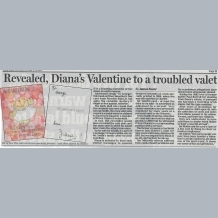 We have no videos for Diana Princess of Wales.